A city that imparts a sense of the ancient inside its walls, Chester, Cheshire is a bustling centre where the old heritage has been lovingly preserved and the new and modern upgrades carefully integrated into its character. Built on the banks of River Dee by the Romans two thousand years ago, the city’s buildings and bridges represent the rich influence of the different periods of its history – Roman, Saxon, Tudor, Georgian, Victorian, as well as its many industries — leather, wool, shipbuilding, lead-working — that have come and gone. Today, Chester is a lively hub for the locals and thousands of visitors who come each year to visit its quaint charm and majestic heritage, stroll on its cobbled streets, enjoy international, eclectic or traditional rustic fare at its numerous restaurants and cafés, sip tea with dainty English sandwiches, a pint or two at a local pub. 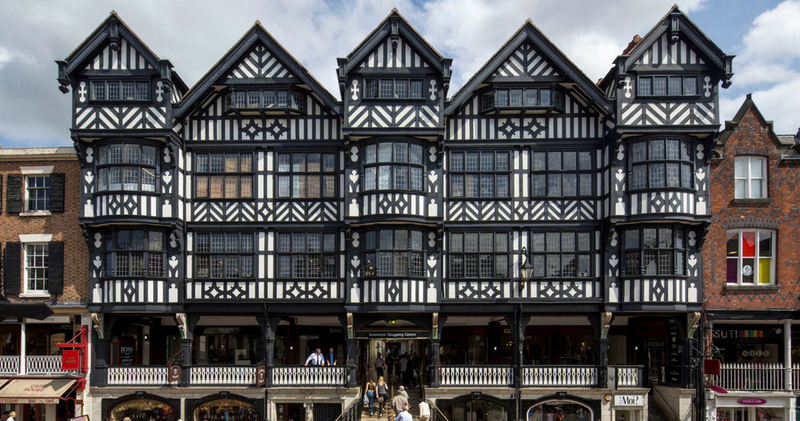 Renowned for fairs and markets since the medieval times, Chester Rows continue the tradition today with its uniquely designed row of shops and galleries. Built in the centre of the impressive and distinctive city of Chester, against a backdrop of historic architecture, stands Grosvenor Shopping Centre with its vast array of designer and department stores to offer you the finest in shopping. Constructed in 1965 on Pepper Street, with entrances located off Eastgate and Bridge Street as well, it is surrounded by the city’s delightful attractions, such as the Eastgate Clock, Chester Cathedral, Chester Market, Grosvenor Museum, Dewa Roman Experience, and the not-to-be missed Chester Town Crier, among many more. Grosvenor Shopping Centre houses 70 stores ranging from the chic and trendy fashion stores such as Topshop and H&M to traditionally classic, colourful collections of Laura Ashley. It has shoe stores, sports retailers, health stores, restaurants offering casual and fine dining, hair and beauty salons and fun stores for kids, like Build-a-Bear Workshop. Treat yourself and your family to a day of pure indulgence! For ladies’ fashions in clothes and shoes, the Grosvenor Shopping Centre has shops like Dorothy Perkins, Pour Moi, Ann Summers, Jigsaw, LK Bennett, Shuh, just to name a few. Men can discover their flair at Boss, Burton’s, Gieves & Hawkes, Topman. For designer collections at discount prices, take a walk through the aisles of TJ Maxx for clothing, gifts, and home goods. Getting engaged or married? How about stopping in at Boodles, among the finest of Britain’s jewellry designers, for a diamond ring? Or perhaps, a special gift of fine jewellery or a Patek watch for someone special in your life. Check out the distinctive jewellery collections while you’re there at Chisholm Hunter, Cheshires, Timepiece and Kayes. You certainly won’t mind bringing your children with you to Grosvenor Shopping Centre. They can have a blast building their own bear, maybe as a gift for Christmas or for a birthday, explore the gift shops, get new clothes and shoes. If you’re thinking of adding unique pieces of home furnishing to your home, seasonal decor or revamping your flat or house, there are stores at Grosvenor Shopping Centre that have a variety of collections for your needs. The shopping centre has 7 home decor stores which include Castle Galleries, Whitewall Galleries, Sostrene Grene and Chateau. While you’re there, pamper yourself with a new haircut and colour at Regis Salon, also located in the shopping centre. Maybe a manicure or pedicure would be relaxing and you would need to go no further than Nailista. Or try out some new scents at The Perfume Shop, if that is your whim of the moment. Shopping is fun, but it certainly makes you hungry. Grab a quick coffee and a bite to eat at Costa Café, or try some delicious cakes, tea, sandwiches, wraps, salads at the Patisserie Valerie, also known for its fresh, delectable cakes for special occasions such as weddings and birthdays. For the larger appetite, you can satisfy your cravings for the Italian specialties at Piccolino, right in the Grosvenor Shopping Centre. Social engagement and community involvement are a significant aspect of Grosvenor Shopping Centre’s presence in the beautiful city of Chester. As part of the historic district, it is a proud member of Chester BID (Business Improvement District) and supports the continued preservation of the Rows Shopping Galleries. It is also involved in community fundraising events for many organisations. There is never a dull moment in the throbbing heart of Chester. Slip on your walking shoes and explore, stroll, shop, wine and dine in one of the prettiest, well-kept cities in England! If you are driving yourself, there is a choice of public parking in Chester, but be mindful of seasonal dates. Travelling with the Hop on Hop off bus around Chester has a stop near Eastgate Clock, which also has a taxi rank located almost beneath it. If you use the park and ride system, there is a free bus service running into Chester city centre every 10 minutes.